Magnesium deficiency in plant determined by test, observation, or known nutritional needs of certain plants and/or systems. 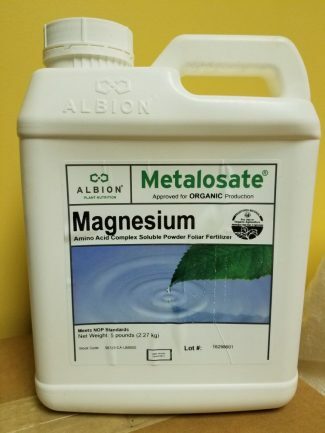 Albion Metalosate Magnesium provides easily absorbable and “plant friendly” magnesium for immediate use by the plant. Albion Metalosate Magnesium is highly water soluble, with excellent uptake efficiency when applied as a foliar spray or through drip irrigation.